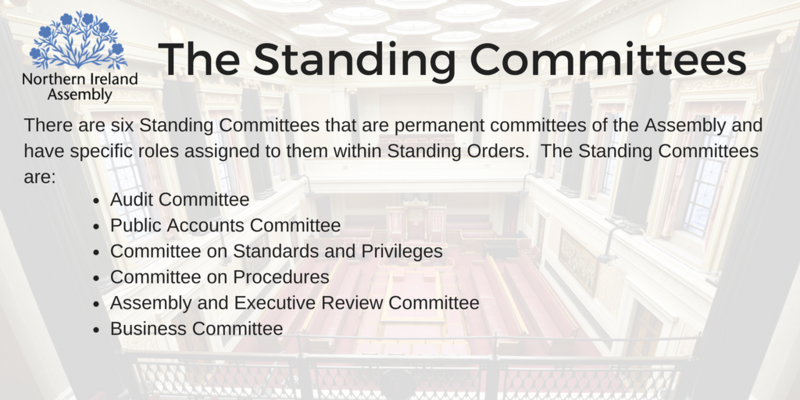 Assembly Round Up: The Committee on Procedures - What does it do and how does it work? The Committee on Procedures - What does it do and how does it work? 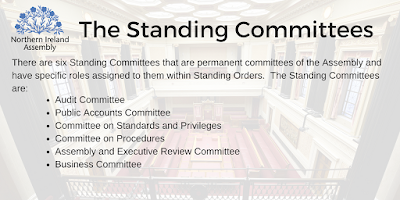 The Assembly’s Procedures Committee is responsible for considering and reviewing, on an ongoing basis, the Standing Orders and procedures of the Assembly and how it operates. Committee may take briefings from Assembly and Parliamentary officials from other jurisdictions, and other stakeholders as part of their inquiries. The Procedures Committee, which is a Standing Committee , ensures that the rules governing the workings of the Assembly are fit for purpose and can be adapted in light of best practice, with the agreement of Assembly members. Some of the areas that the Committee has carried out inquiries on are: the review of the Public Petitions procedure, a review of the business week of the Assembly, an Inquiry into Topical Questions, which resulted in topical questions being added to the Question Time rota, and an inquiry into Attorney General participation in the proceedings of the Assembly. The Committee is currently considering issues relating to the Official Opposition, as well as the introduction of an e-Petitions facility. The Committee meets regularly in Parliament Buildings and you will find details on the Assembly’s Business Diary. You can also listen to the Committee meetings on niassembly.tv or access the ‘Listen Again’ the day after the meeting.